Production Sources disagree strongly, but probably about 30 sets from 1942-12 to 1943-10. Those produced before 1943-7 were considered prototypes. 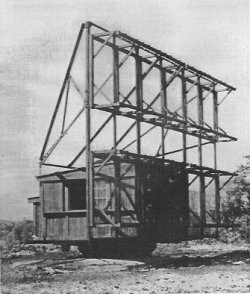 Also known as the Mark 1 Model 1 Type 2 or the Type-B pulsed radar, the Type 11 radar was a Japanese Navy land-based early warning radar. The prototype model was the first Japanese radar captured by Allied forces, who found it near the unfinished airstrip on Guadalcanal, and it became known as the "Guadalcanal radar". Its range was limited to about 35 miles (55 km) on single aircraft. It was housed in a wooden shack on a concrete pad, the entire installation turning on a converted torpedo mount. An original design, it was installed in the Aleutians, Marshall Islands, and Marianas. I had a look at it and I remembered being impressed how crude it was compared with our own early sets — and goodness knows, our first generation SCR-258, -270 and -271 sets were crude enough! Nearly all the tubes in the Japanese equipment appeared to be copies of types made by General Electric. The production version ("Attu radar") had an improved range, about 75 miles (120 km). It was found throughout the Mandates and at Iwo Jima. There is much confusion in Western sources on this radar. Guerlac (1987) claims several thousand were produced, but Nakagawa (1997) states that only about 30 were built. It is likely Guerlac is confounding this set with later models such as the Type 13, of which Nakagawa claims a thousand were built.